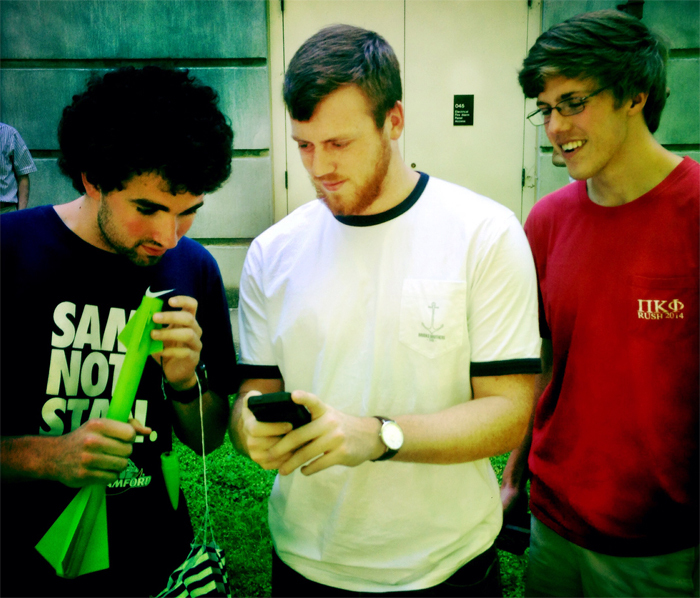 Samford University physics students will end the academic year in unusual style May 7 at 2 p.m. as they test rockets they designed and built with the aid of a new 3-D printer. The eleven students in professor Alan Hargrave’s physics seminar engage in the physics and engineering disciplines in ways that go beyond the traditional classroom experience. Typically, they plan projects in the fall offering of the course. Hargrave, Physics Department chair, said the spring offering of the course requires hands-on work to familiarize students with various design and construction tools and techniques. In previous years, the students created moon buggies for the annual competition at the U.S. Space & Rocket Center in Huntsville. This year, the students turned to rocket physics. Hargrave noted that rocket projects are common in physics education. He wanted his students to experience a unique challenge, so he required them to learn Computer Aided Design (CAD) software and 3-D printing technology in addition to the required physics. Hargrave set basic rocket size specifications—small enough to launch in Samford’s quad but large enough to be seen in flight–but encouraged the students to be creative otherwise, as long as the rockets could fly. The rockets are now complete and tested, and Samford’s quad awaits the public launch of the projects. During the event, the teams will describe their projects, highlight special design features, launch and, if time permits, recover their rockets for a second launch.